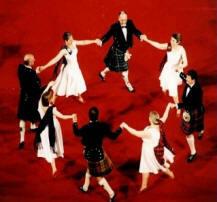 Deeside Caledonian Society meets every week, from September through until May, to enjoy Scottish Country dancing. We meet on Monday evenings in Royden Hall near Frankby Green from 19:45 to 22:00 hours. Most of the dances are walked through each evening. Any dances which are not walked through are indicated on the programme. New comers are very welcome. Come along and introduce yourself. We’ll teach you what you need to know to enjoy the dancing. Members are charged £2.50 per night plus £10 annual registration fee. Guests and new comers are not charged for the first night. .............It’s Scottish Country Dancing !